Newcastle - Arsene Wenger admits it will take a major slip from Chelsea to allow Arsenal back into the Premier League title race. Wenger's side will attempt to put their agonising midweek Champions League exit at the hands of Monaco behind them when they travel to face Newcastle on Saturday. Victory at St James' Park would extend their run of five successive league wins, a sequence that has taken them to within one point of second-placed Manchester City and seven points behind leaders Chelsea, who have a game in hand. 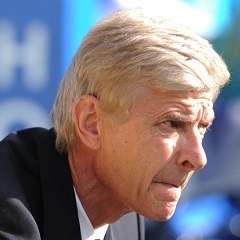 Wenger believes his side are gathering momentum at an important time of the domestic campaign, although he accepts the disappointment of going out of Europe on the away-goals rule despite winning 2-0 in Monaco in the second leg has dented morale. "At the moment we are too far away from Chelsea, but we have an opportunity every week to get closer and for that we need positive results from us, and negative results from Chelsea," Wenger said. "The only thing we can master is positive results from us. I believe Chelsea still has a very good cushion and very good security. "They still have a game in hand. I believe they are too far apart at the moment. "Every year is different. We just have to focus on our performances. I do not count on the weaknesses of any of our opponents. We just have to focus on our strengths." A more immediate target is to overhaul City in second spot, although Wenger believes the battle between the contenders for a top four place is too close to call. "It is very tight, we are on the neck of Manchester City but straight behind us we have Manchester United, Liverpool and it is a very tight race," he said. "Even Tottenham are not completely out of it, and Southampton are not completely out of it." However, Wenger admits his side must lift themselves after once again failing to reach the last eight of the Champions League again. "We are on a good run. We won the game. We are frustrated and disappointed to go out, but it's not down to our performance on Tuesday night, it's down to our home performance, especially on the defensive front - we paid for it," he added. "We were a bit unlucky as well because if you look at the number of shots on target Monaco had in the two games, they have been very efficient in qualifying." Tomas Rosicky could return to the Arsenal squad but Mikel Arteta, Mathieu Debuchy, Jack Wilshere and Alex Oxlade-Chamberlain are still out. Newcastle are short of defensive options as they look to record a first home victory over the Gunners since 2005. Skipper Fabricio Coloccini starts a three-match suspension for his sending off in last week's 3-0 defeat at Everton that leaves John Carver's side 11th in the table, 10 points above the relegation zone. Massadio Haidara is again set to miss out with a knee problem, with fellow defenders Steven Taylor, Paul Dummett and Curtis Good not due back from injury until the start of pre-season training. Interim head coach Carver's record of two wins from 11 games since taking charge following the departure of Alan Pardew in January has failed to enhance his hopes of earning the job full-time in the close-season. "We're short on numbers, and it won't be a difficult team selection because we've got 13 fit senior outfield players," he said. "It's down to me to work with the ones we've got available. We're down to the bare bones." Coloccini joins Newcastle's 11-goal top scorer Papiss Cisse in being ruled out by suspension, and Carver added: "Just when you think you're getting somewhere with players coming back, then you go and lose your captain for three games."